While Israel is deservedly known for its abundance of ancient sites and rich history, as well as its sophisticated high-tech capital, it is also known for being a land of adventure. 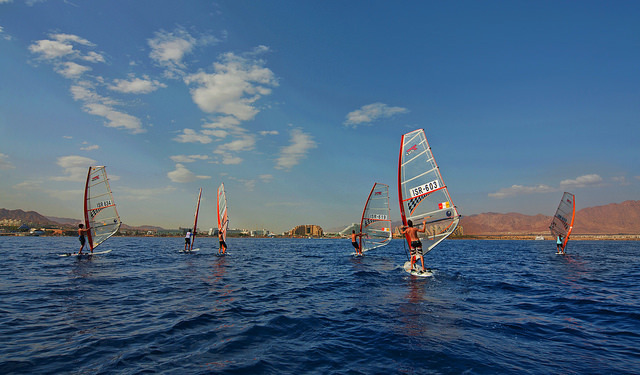 A country just about the size of New Jersey, Israel is an adventure tourism destination unlike any other. Climb the summit of an ancient fortress. Just across the Dead Sea is one of Israel’s most popular tourism destinations, the legend Masada, a 2,000-year-old fortress built by King Herod. Some travelers prefer the scenic cable-car ride up to the top of Masada, but adventure-seekers can embrace the challenge of climbing the “Snake Path” to the top – and enjoy the reward of the awe-inspiring sweeping views of the Dead Sea and Judean Desert from the top. Take a dip in three seas. Despite her tiny size, Israel offers a unique opportunity to swim, surf, snorkel, dive or simply relax in three different stunning seas: the Mediterranean, the Dead Sea and the Red Sea, all of which can be experienced over a day or two. From the saline-rich waters of the Dead Sea, the lowest point on Earth at 1,388 feet below sea level, to the lively water sports scene on the Mediterranean shorelines, to the underwater haven for tropical fish and colorful coral reef in Eilat on the Red Sea, Israel’s waters will not disappoint. Travelers can trek the length of the country through breathtaking natural wonders amidst historical sites. Now part of the new Gospel Trail, Israel’s northern Galilee region has a 40-mile walking route that makes stops in major holy sites from the time of Jesus, including Capernaum, the Mount of Beatitudes, Tabgha and Nazareth and the Sea of Galilee. From Rosh HaNikra, a cliff-side beach in Israel’s northern tip with its unique collection of underwater grottos, to Ein Gedi National Park, a gorgeous canyon with various hiking and climbing trails and pristine natural streams, to Mitzpe Ramon in the south, the world’s largest naturally formed crater, and Timna National Park, a moon-like desert park with hiking trails and spectacular rock formations—guests can explore the many facets of Israel’s natural splendor. No matter the season or sport, there are plenty of incredible adventures for the whole family to enjoy.